Teldrassil. One of the five vast World Trees and home to the night elves. Bathed in shadow from the thick crown, it hosts a unique and eternally-twilight ecosystem. It's one of my favourite zones, conjuring to mind shades of silver and dusky purple hues amongst thick foliage and floating orbs of lunar light. Night elves are an Alliance race, and though I've long been pro-Horde, they are one of the two Alliance races I'm happy to play, second being dwarves. I'm not keen on elves in general, my heart lies with the latter, but night elves manage to cut it if just for their culture and colours. In the coming expansion, however - and I do feel a little guilty about it - the Horde burn Teldrassil down. I'm not yet privvy to the details - perhaps it's explained in Before The Storm, which is sitting on my nightstand beside The Redemption of Althalus, which I've very nearly finished, if not in an in-game pre-expansion event. But regardless, the World Tree will burn, likely as most by the order of the Dark Lady. Which is presumably why Tirisfal Glades falls under siege shortly afterwards, as mentioned on Monday in my Tirisfal Glades porridge. 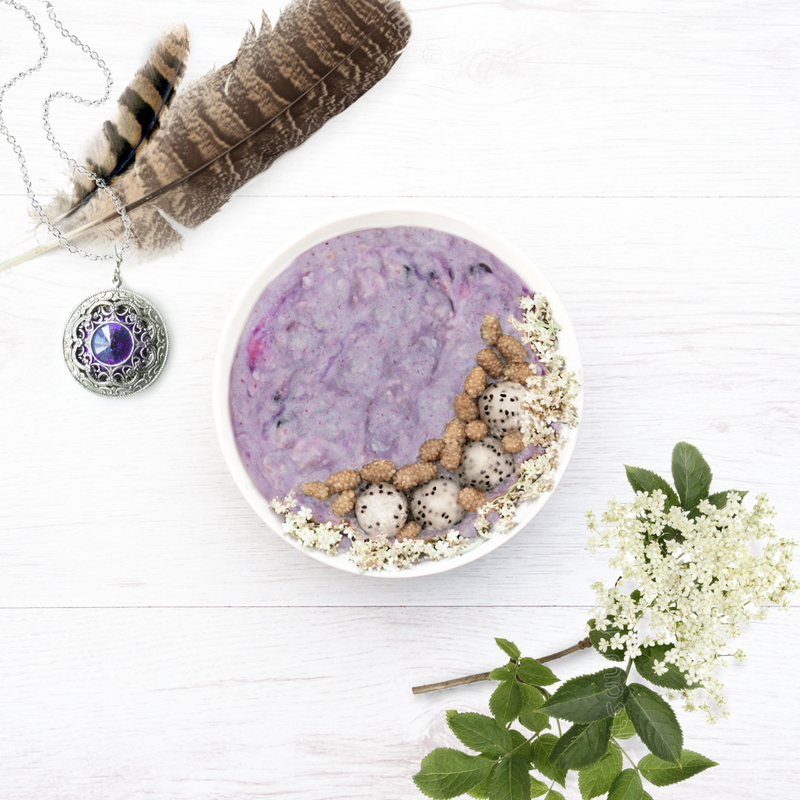 I made this porridge to reflect the night elves' devotion to Elune, the Goddess of the Moon, and tried, as last time, to use ingredients that would be found in the region - namely berries, butterfly pea flowers and elderflowers. The priestesses often wear shades of white and silver, so I used white mulberries, dragon fruit and elderflowers and arranged them in a crescent, while the purple porridge - naturally coloured, as always - resembles a combination of their skin, cultural colours and general ambience of Teldrassil. Moonberries weren't an option, sadly, so I've used blueberries instead along with 1/4 teaspoon of butterfly pea flower - often used in Malay cooking and a Thai tea - to give it a lilac colour without hampering the flavour of the porridge, which itself is elderflower. As always, nutritional information and notes are at the foot of this post. I always subtract the whey and added the info as an addition beneath the base porridge because not everyone may have protein powder on hand, and the same goes for the dragon fruit and mulberries. 1. Combine oats, whey, butterfly pea flower in a bowl (or shaker bottle) and, stirring all the while, add the milk and mix until combined (or shake and transfer to a bowl). Omit the water. 2. Add blueberries and set in the fridge overnight. 3. If you'd like it warm the next morning, stir in 50ml water and heat in the microwave for 1 minute, then stir, and heat for 20-30 second bursts, stirring in between, until desired consistency is met. Add more water if needed, then stir in the cordial once complete. Go to step 5 below. 2. Combine oats, whey and butterfly pea flower in a saucepan and, stirring all the while, slowly add the milk and boiling water. 3. Stir in the blueberries, then bring to a boil over medium heat, and reduce to a simmer for 15-20 minutes until thickened to your liking, stirring occasionally. 4. Transfer to a bowl and add the cordial, stirring through. 5. Garnish with scoops of dragonfruit - see notes for how to prepare and store left-over dragonfruit - mulberries, fresh or rehydrated (soak dried berries in hot water for 10-15 minutes and drain), and elderflowers. Serve immediately. • I used Pulsin premium whey. • I used Belvoir organic elderflower cordial. • I sourced my elderflowers & dragonfruit from Fine Food Specialist. • How to prepare & store dragonfruit.